"The Fu Yong Shrimp is an excellent alternative to Westernized Egg Foo Young. The shrimp are large and tender and the flavors are more complex than your average Chinese. The rest of the food was also above average and the delivery was quick. I'm giving it 5 stars instead of 4 because somehow the other, inferior restaurants in the area are receiving high ratings and Rice Box deserves to stand above them." "Best chinese food in the whole area without a doubt." "Best Chinese food EVER. Plus the guy working there is super cool and helpful for Take Out. I think they do *not* use MSG, which is fantastic. So I'm visiting my mom from NY City. Until eating at the Rice Box, I thought Flushing Queens was home to the best Chinese food. But Sarasota is where it's at and my whole family agrees. We like *Spicy* here is our order using the 5 Star rating for each dish: 1) Ma La + Beef = 5 STARS If you like spicy, tongue-tingling Sezchawan style, GET THIS. Ma La with Beef is enlightening. Amazing. 2) Thai Curry + Chicken = 5 STARS Also spicy. This Thai dish features the coconut milk and patented white curry blend + visible spices. LOVE. 3) Szechuan Garlic + Chicken = 5 STARS There are *grill marks* on the chicken, which means Rice Box takes Chinese food preparation to a whole new level. Flavors pop. 4) Eggplant + Tofu = 4 STARS This is among the best Eggplant we've had, however, our mom was the only one who actually likes eggplant. Our least favorite dish in general, but our mom wanted a vegetable... WE ARE GOING BACK. There were no left overs and we agreed we want to revisit Rice Box before we leave. LOVE." "We love this place! Our family finds the faimly feast (small) more than enough for a family of four with teenagers!" "Just had my first Rice Box experience...it was so fresh and delicious - my new Go-To Chinese restaurant!" "Thanks for another delicious meal last night!! So good had left overs for breakfast!!!!!" "Best Chinese cuisine in SW Florida!" "I order from them all the time. Great place!" 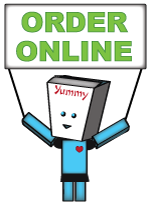 "I have ordered delivery from them twice - apps and egg fu young - I'm from Boston and very picky and this was the BEST CHINESE FOOD IN FLORIDA!!" "This is the best take out dining in Sarasota. They always go over your order with you,and will modify any order to please the customer. I give them four stars. It's the best since the Golden Buddah." "Our small office orders from here at least once a week. We think the food is awesome! The Moo-Goo is the best I've ever had, with lots of always fresh veggies. Cashew Chicken is also excellent. Ditto, spring rolls and Mandarin Chicken.The edamame is always fresh and amply served. The service is excellent (delivery) and always extremely polite. So happy to have found RICE BOX EXPRESS! Highly recommended!"